Trees are some of the most important controls used to build modern web applications. HTML does not provide any tree elements out of the box, but by using the Ignite UI library by Infragistics, you can very easily create a tree control in your application – simply use the Ignite UI tree control, igTree. In this post, we will show you how to get started with this control in three simple steps. Let’s get started! Download IgniteUI and add the required files to your project, referencing local IgniteUI files from the project. Via CDN: the Ignite UI team provides a public CDN to use. Ignite UI core, dev, and lob libraries. Let us start with creating LOCAL JSON data to bind to igTree. 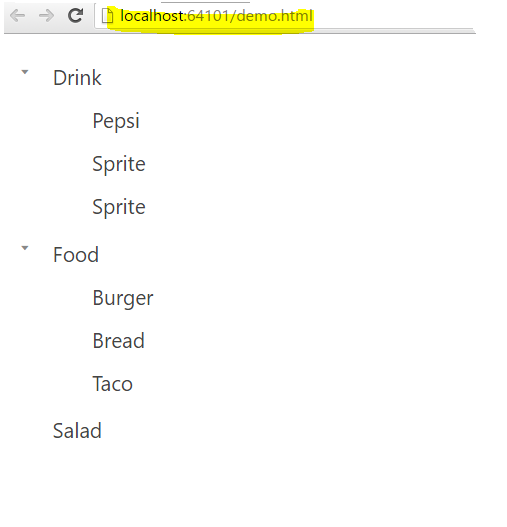 In this example we are creating foodsData, which has three fields: ID, Type, and Items. If you take a closer look, you’ll see that we’ve set the binding properties to the different fields of the JSON data. For example, textKey is set to Type field, valyeKey to the ID, and so on. At this point, when running the application, you will find the igTree generated with the local JSON data. Here the Salad node is empty because there are no items in it. For the other nodes, sub items are bound using the Items field of the data source. There you have it: the beginnings of working with the igTree! Keep an eye out for future posts where we’ll focus on other features. Thanks for reading!